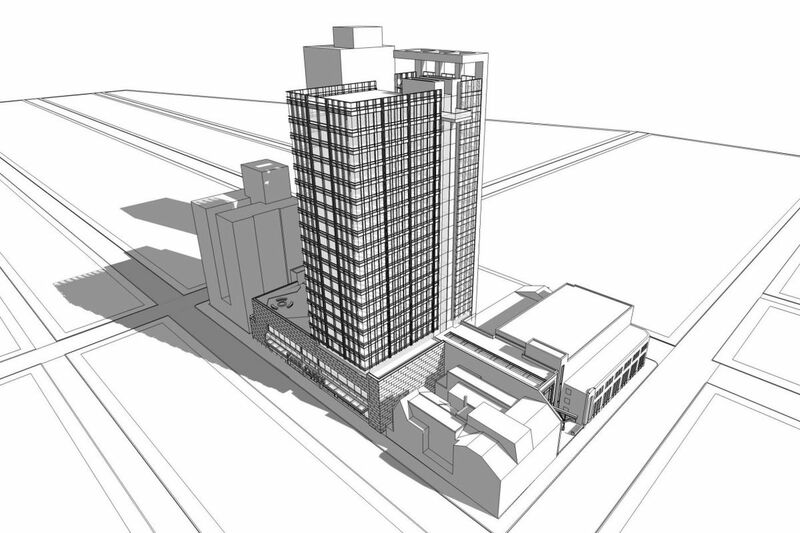 Diagram of the Harper apartment tower planned for the former site of the Boyd Theatre’s auditorium, as seen from the corner of 20th and Sansom Streets. Pearl Properties is scaling down its apartment tower project on the Rittenhouse Square-area property where the Boyd Theatre's ornate auditorium once stood, as Center City faces an abundance of high-end rental housing that landlords may struggle to fill. Pearl is building a 24-story, 183-unit tower at 1910 Chestnut St., according to a zoning permit issued Tuesday to the Philadelphia-based developer. That's instead of the 32-story, 250-unit structure that it presented during the project's permitting process. Artist’s rendering of the Harper apartment tower planned for the former site of the Boyd Theatre’s auditorium, as seen from Sansom Street. The change comes as developers contend with a pipeline of new apartments scheduled for delivery in coming years that could overstep demand, even in sought-after locations like Pearl's Rittenhouse Square-area environs. "There's a good bit of inventory available, and the occupancy rates have dropped," said Christophe Terlizzi, regional head of KeyBank's commercial real estate practice. "We're probably going to have an overhang for a while because the population hasn't kept pace." Pearl partner Reed Slogoff declined to discuss the changes. Site work on the tower, which Pearl is calling the Harper, began in August, capping a development saga that began in 2014 when a previous owner tussled with preservationists and film-house buffs over plans to demolish the cavernous art-deco auditorium of the Boyd – known as the Sameric in its most recent incarnation – to make room for modern multiplex screening rooms. Pearl jettisoned the multiplex plan after acquiring the theater and some adjacent buildings the following year and had the auditorium razed to make way for a residential tower. Plans for the parcels' Chestnut Street frontage — which now include a Target store, offices including Pearl's own, and upscale Spanish eatery Tatel behind the Boyd's restored façade — were approved that June. Designs for the 32-story apartment building approved by city officials about six months later were refined through discussions with nearby residents who panned Pearl's earlier proposal for the site. Its current move to downsize the project by 67 units comes amid a flattening in apartment rent growth. Rent increases for the city's highest-end, or Class A, high-rise apartments increased just 0.5 percent over the 12 months that ended Sept. 30, 2017, compared with an increase of 1.6 percent over the four years that ended then, according to data from Washington-based real estate tracker Delta Associates. The inventory boom behind that flattening growth shows little sign of subsiding either, with 6,000 new apartments due for delivery in Greater Center City — defined as the stretch from Girard Avenue to Tasker Street, from the Delaware River to the Schuylkill — between 2015 and 2018, an increase of 10 percent over current supply, according to the Center City District business association. Much of that new supply consists of high-end apartments against which projects like the Harper will compete for well-heeled tenants, said Andrew Townsend, who directs the national multifamily housing group at commercial brokerage Marcus & Millichap. Still, the project's location near Rittenhouse Square bodes well for the project in its shrunken form, he said. Similarly situated is Nashville-based Southern Land Co.'s plan for a development of apartments, condo units, and retail space on an assemblage of properties centered at 1911 Walnut St., which a spokeswoman said this month will consist of 258 rental units and 75 condos. Townsend said projects in other parts of the city could encounter greater headwinds, but among those with the greatest chance of success is PMC Property Group's plan for two apartment towers along the Schuylkill's eastern bank near Arch Street. That location is situated to benefit from development along the Schuylkill's Center City banks, where projects including Aramark's new corporate headquarters are rising, and across the river in University City, he said. PMC executive vice president Jonathan Stavin said in an email this week that the company plans to break ground before the end of this year on the first of the two towers, a 28-story building with 291 units.